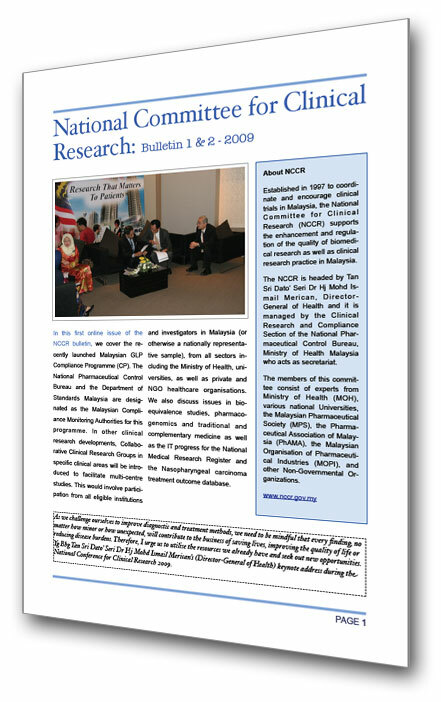 In this first online issue of the NCCR bulletin, we cover the recently launched Malaysian GLP Compliance Programme (CP). The National Pharmaceutical ControlBureau and the Department of Standards Malaysia are designated as the Malaysian Compliance Monitoring Authorities for this programme. In other clinical research developments, Collaborative Clinical Research Groups in specific clinical areas will be introduced to facilitate multi-centre studies. This would involve participation from all eligible institutions and investigators in Malaysia (or otherwise a nationally representative sample), from all sectors including the Ministry of Health, universities, as well as private and NGO healthcare organisations. We also discuss issues in bioequivalence studies, pharmacogenomics and traditional and complementary medicine as well as the IT progress for the National Medical Research Register and the Nasopharyngeal carcinoma treatment outcome database.